Despite the best efforts of the Dartmouth bubble, news permeates every second and area of our lives. Push notifications from Twitter, Instagram and your news app of choice in the bucket of pure content that gets dumped over our heads in the morning. Amidst all this information, it is more difficult than ever to discern fact from fiction. This week’s theme of admissions examines the concept of truth as an admission of truth. English and creative writing professor Jeff Sharlet answered some questions about the current state of journalism, truth-telling and his personal experience entering into and thriving in the world of writing. Like any number of writers, I harbored dreams of becoming a writer beginning pretty much as soon as I could read. But it was a course I took my second year in college, “Literary Journalism” with Michael Lesy — a friend and mentor to this day—that really converted me to the idea that this was what I was going to do with my life. I’d gone to college thinking I was going to be an actor, or maybe a park ranger, or, if neither of those careers panned out, maybe just another lawyer. I can remember the day that changed, sitting in the library, reading “Let Us Now Praise Famous Men”, a wildly overwrought grand, brilliant failure of a book by James Agee and Walker Evans, and thinking This. This is it. And it has been. Was there one topic that sparked you desire to write? No, but there are questions that have shaped much of my writing life. When I was 16, I watched my mother die slowly and painfully of breast cancer. Toward the end, she began summoning different sorts of religious people to her bedside to pray with her. Buddhists, Hindus, Jews, the general American range of Christians. I noticed a difference in their prayers. Some wanted her to seek some variation of salvation, [or] hope for her soul after death. Others listened to her and prayed with her for deliverance from death. That divide between salvation and deliverance — the so-called hereafter and the here-and-now — has been an animating question for most of my books, even as they range widely in topic. What medium do you prefer (short form opinion, longform investigative, Instagram post, etc.)? I strongly dislike short form opinion, though like everybody else I binge on “takes” from time to time. For most of my writing life I’ve practiced what’s sometimes called “immersion journalism,” in which you immerse yourself in the world you’re documenting. I prefer the term “submersion journalism,” since I like to get in over my head. I never thought of myself as an investigative journalist when I was younger, since although I’d been trained at the San Diego Reader by a ferocious investigator, I was driven more by curiosity about how other people lived. Some of those “other people,” though, have been folks who might be said to be up to no good. So understanding their lives comes to resemble investigative journalism. I’m being coy, though: Yes, I’m an investigative journalist, at times a pretty hard-nosed one. But I’m not interested, in my own writing, in the “gotcha.” If bad guys get got — and they do, sometimes, in my stories — that’s icing on the cake. In a world of the 24-hour news cycle and “fake news,” is there one news source you recommend? The short answer is: “outside.” Put a notebook in your pocket and go out and talk to people. But I understand that you’re looking for media. I doubt there ever was “one” news source I’d recommend. It just doesn’t work like that. Like a lot of professors, I read The New York Times and listen to NPR. I’m a critic of both, but there’s no denying that in general, they’re very, very good. For me, WNYC’S On the Media is an indispensable guide to thinking about the news. I also check in pretty frequently with far-right news sources, such as Breitbart, not for “balance,” a problematic concept, but because they’re there, and I want to know how they see the world. I read the lefty magazines that still do some of the best investigative reporting, such as Mother Jones. Democracy Now! is also good in that regard, especially on stories “mainstream” media overlooks. I depend on Longreads and Longform and Twitter to point me to the best longform journalism, much of it “news” in magazines and journals. I read The Valley News every day. 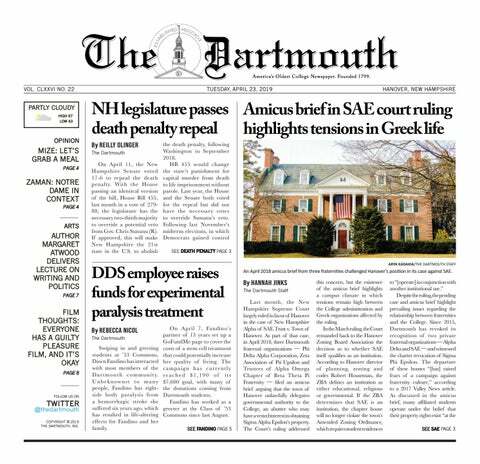 I read The Dartmouth. The only time I watch cable news is at the gym, and then I usually look away — there’s just almost no reporting. And of course I read books. A lot of books — including fiction — are “news,” too. This year I get to be a nonfiction judge for the National Book Award, which means I’ll receive every new title of any note. Many of them will be speaking to the questions of the day, and the questions of yesterday that we should be considering now and the urgencies of tomorrow. AKA “news.” It’s a broad, broad category. This article has been edited and condensed for clarity and length.